On Thursday night last 10th November Emmets Coiste na nÓg launched their Christmas Draw. 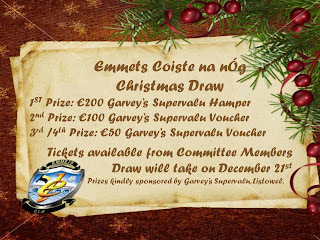 The draw will consist of four prizes kindly sponsored by Garvey's Supervalu, Listowel. Tickets are priced at 2euro each or 3 tickets for 5euro. All money will go towards the upkeep of the Coiste na nÓg. Tickets are available from committee members.